Cantina Del Glicine and Civic Museum of Ancient Art (Palazzo Madama) are good opportunities to explore the local culture. Appreciate the collections at Museo Nazionale dell'Automobile and Museo Pietro Micca. 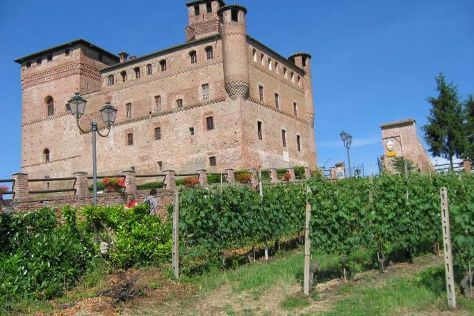 You'll find plenty of places to visit near Turin: Castle of Grinzane Cavour (in Grinzane Cavour), WiMu - Museo del Vino a Barolo (in Barolo) and Acqui Terme (La Bollente & Spas & Wellness). The adventure continues: steep yourself in history at Basilica di Superga, see the interesting displays at Museo Nazionale del Cinema, stroll through Parco del Valentino, and take in the spiritual surroundings of Cathedral & the Holy Shroud. To find ratings, more things to do, maps, and other tourist information, refer to the Turin trip planner. If you are flying in from Hong Kong, the closest major airports are Turin Airport and Cuneo International Airport. In September, daily temperatures in Turin can reach 27°C, while at night they dip to 17°C.